When I got the Isa Does It cookbook, I spent a delightful evening poring over the recipes and marking all the ones I wanted to make. Well, there are a ton of recipes marked, and I can’t wait to get to more of them. But… one of them influenced me faster than that. 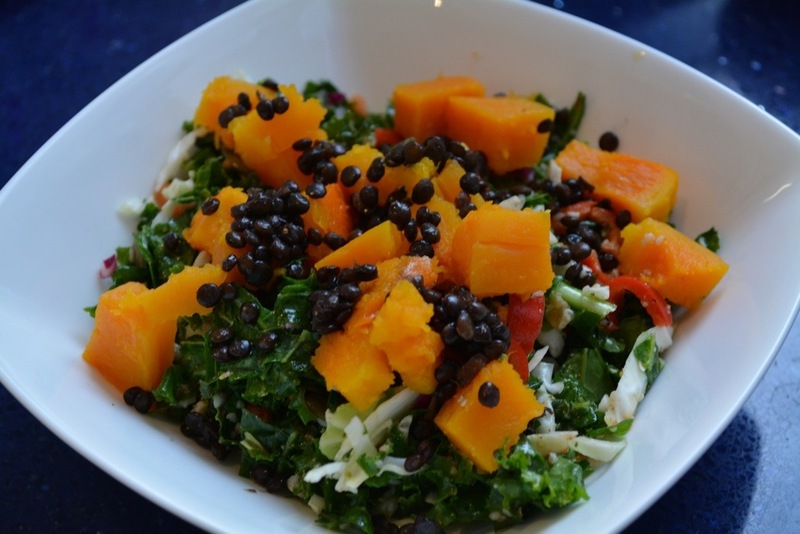 I saw Isa’s “Kale Salad with Butternut Squash and Lentils” and decided it was a perfect combination. So when the lovely Ash came over for lunch, and I needed something to serve with Hot & Sour Soup, I decided I’d make my own version of a kale/lentil/butternut salad. I used a dressing that I’ve been putting on kale salads around here for a while now: a Smoky Maple Dressing — that gets its smoky flavour from smoked paprika, and a lovely sweetness from maple syrup. In this recipe, massaging the kale with your hands makes the leaves wilt a bit so that they are tender enough to enjoy raw. And it’s one of those activities that’s calming for you… even though you’re the one giving (not getting) the massage! We also added a calming tea pairing: Thai Rooibos from Harney & Sons, which Ashley brought back from New York! It’s a rooibos (red bush tea) laced with cinnamon, ginger, coconut, and lemongrass. 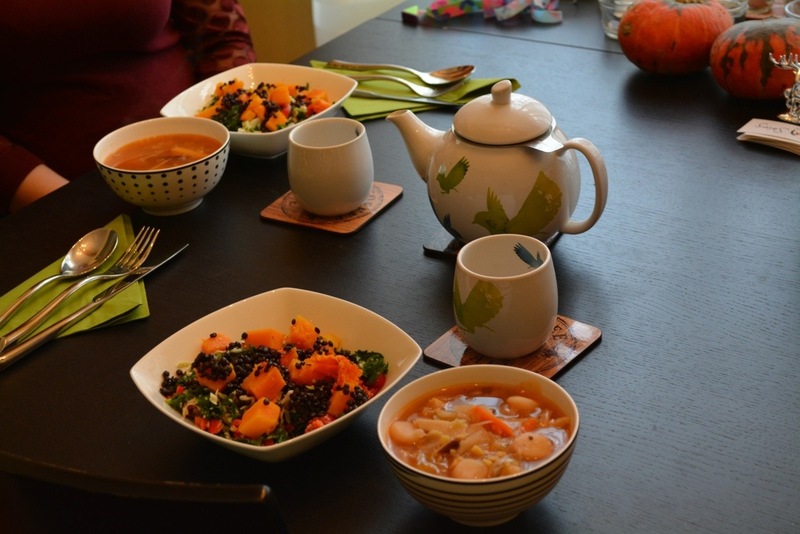 Between the Hot & Sour Soup, the salad, and the tea, we were full of healthy goodness. You can do a lot of the prep for this salad ahead of time: roast the squash, cook the lentils, and make the dressing. Then all you need to do is pull everything together and toss. Any leftovers keep well in the fridge without wilting for a couple days. Serves 2 as a meal or 4 as a side dish. Begin by roasting the squash: Preheat oven to 425F. Slice the butternut squash in half and place cut-side-down on a baking sheet. Roast at 425F for 25 minutes until the flesh is tender. Let cool, then remove the skin and cut the flesh into cubes. While the squash is roasting, cook the lentils: Pour the vegetable broth into a medium pot, and bring to a boil. Add the lentils and bring the heat down to a simmer. Simmer for 20-25 minutes, until the lentils are al dente, then set aside to cool. Prepare the salad: Remove the kale leaves from the stems, and discard the stems. Wash the leaves and pat or spin dry. Finely chop the leaves. In a large bowl, toss the leaves with the Smoky Maple Dressing and gently massage with your fingers. Let sit for 10 minutes while you prepare the rest of the salad. Once everything is ready, add the cabbage, and red pepper and toss to coat all of the veggies with the dressing. 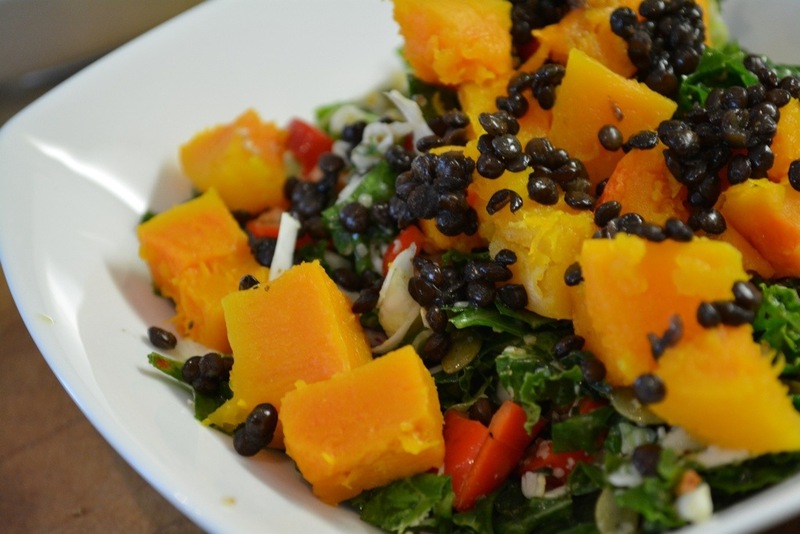 Serve in bowls, topped with the roasted squash, and cooked lentils. In a small bowl or mug, mix together the mustard, paprika, and sea salt. Whisk in the maple syrup, vinegar, and olive oil. Set aside. 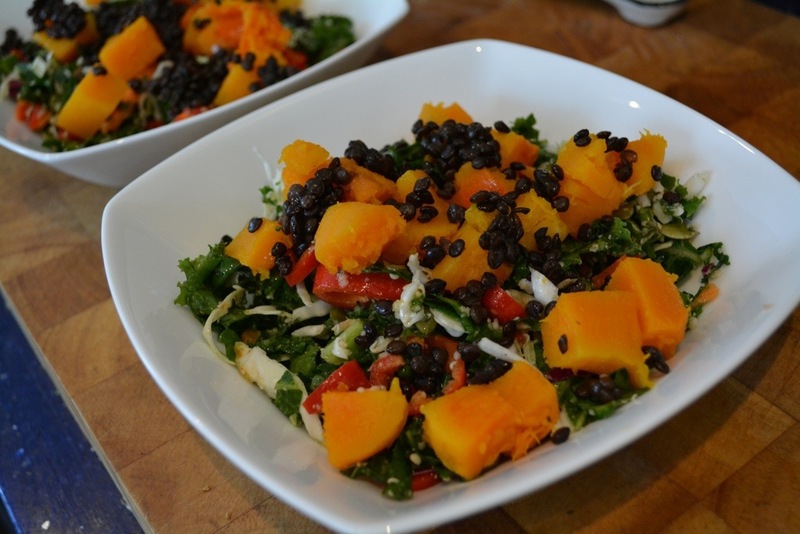 Isa’s Kale Salad with Butternut Squash & Lentils looks like my kinda comfort food and yum on Hot & Sour soup. Thanks for sharing her recipe!